It’s isn’t anywhere, really, lost amid the vastness of timberlands between Perry, Lamont, and Newport. Yet it is somewhere, somewhere extra special, a cradle of civilization during the Pleistocene, a place that feels like you might round a bend and encounter a mastodon. 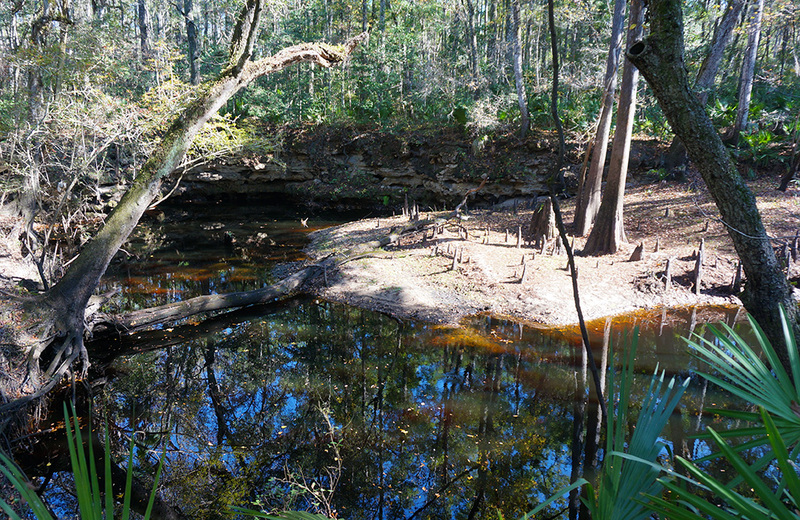 It is Florida’s own “Land of the Lost,” where the Aucilla River gets swallowed by the earth to emerge in vast rocky cauldrons where ancient peoples flaked flint to make their spears. These are the Aucilla Sinks. 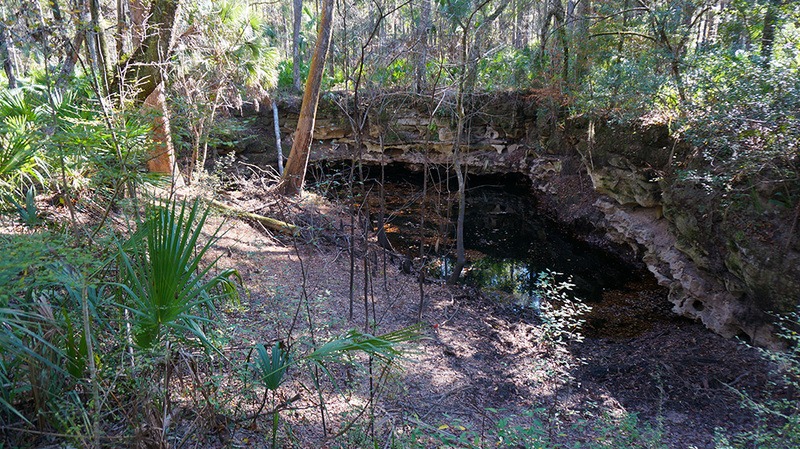 Few places in Florida provide such a dramatic backdrop for on-site lessons in geology and archaeology Our statewide National Scenic Trail, the Florida Trail, weaves through this protected ribbon of rugged landscape, leading you along the lips of massive sinkholes and karst windows. Following the orange blazes south from Goose Pasture Road in the Aucilla WMA off US 98 in Taylor County, you’ll discover a piece of Florida you must see to believe. Nearly two decades ago, the University of Florida and National Geographic sent researchers into this oddly-formed place to discover how ancient hunter-gatherers tracked their prey. Here, a kill would be easier than in most places in Florida, which explains the vast number of artifacts uncovered by the team, including a mastodon tusk removed from a butchered animal. These water holes, which exposed a portion of the river running through the rocky aquifer below, attracted animals to the drinking water. Some of the sinks are very steeply sided with little means of access, or escape. Herd a mastodon over a bluff, and toss spears. Repeat. A visit to the Aucilla Sinks is one of those “must dos” for anyone who enjoys the unusual in the outdoors. 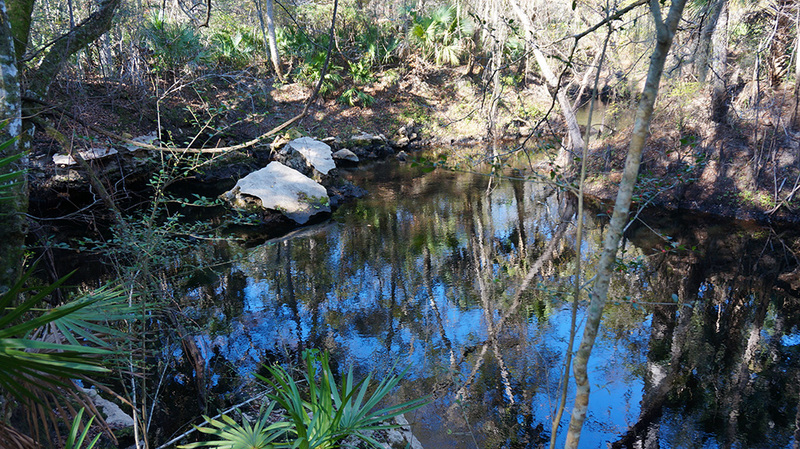 Walk south from the well-marked trail crossing at the Aucilla Sinks kiosk on Goose Pasture Road to enter this extraordinary expression of geology, but watch your footing – and avoid hiking through floodwaters. If waters rise onto the trail, you won’t be able to tell where the huge dropoffs are. After you cross the second forest road amid the sinks, it’s time to turn around for a 2.5-mile stroll. Feel free to explore farther, of course. 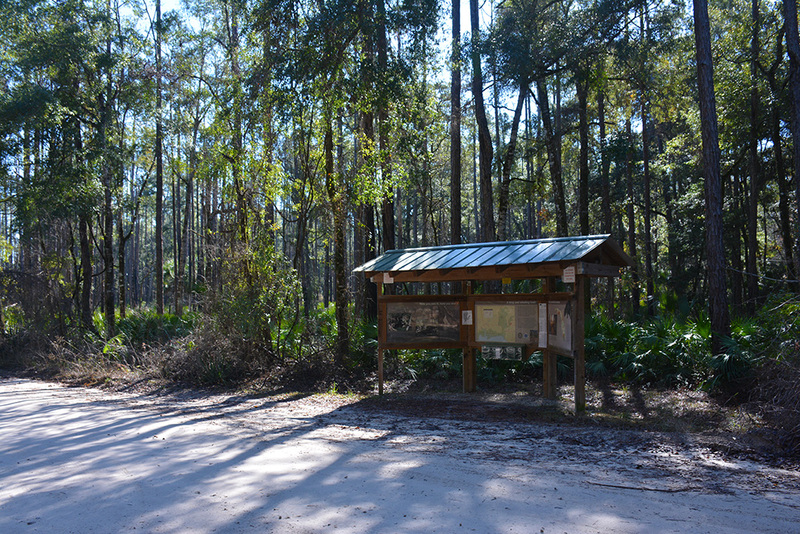 Where the Florida Trail leaves the sinks to join an old logging road headed east, that turnaround point will net you an 8.4-mile day hike in rugged terrain. Primitive camping is permitted, with a backpacker’s campsite 2.6 miles south of Goose Pasture Road. Wear blaze orange during hunting seasons.